I was one of the crazy ones that woke up at 3AM on October 27th, 2017 to pre-order a 256GB iPhone X. I was preparing for an upcoming trip to Israel and I wanted to take this camera (I mean phone) along to help capture some of the amazing locations in that beautiful land. I knew I would be shooting tons of video with the iPhone X running on a gimbal (the DJI OSMO Mobile) and wanted access to the best iPhone camera I could get. What I wasn’t thinking much about in my planning was how amazing Portrait Mode would be on the new phone for still images and how much this feature would distract me from shooting video, nor did I realize one of the major quirks I would experience with it. 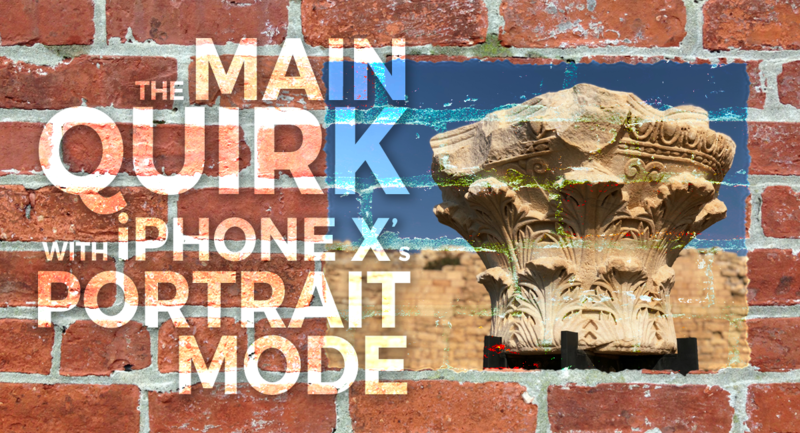 The iPhone X arrived about a week before I left for Israel, so I didn’t have a lot of time to put it through it’s paces. My attention was consumed with making sure I could get the iPhone X properly balanced on the OSMO and that I had a way of capturing good, clean audio with my RODE mic. Again, my focus was on the video capabilities of the new device and not on the stills. I had upgraded from an iPhone 6, so I was new to Portrait Mode. I took a few shots with it prior to leaving for my trip, and was impressed with it’s quality, but I didn’t shoot in enough situations, nor study the images closely enough to see some of the quirks that would appear in the field. My trip to Israel was a pilgrimage of sorts with about 70 team-members on two buses. The entire trip I was the dork running around with the gimbal and slowing the team down because I always needed “one more shot”. We were rushed most of the time, because there are far too many amazing sights to see in Israel. As one of our tour guides put it, “you get to run where Jesus walked!” With my focus being on the video, I would try to take as many still pictures as possible, but since we were always in a hurry to get back on the bus, I was not always in a position to look at and study the images in the field. I got the occasional glance to see if something looked decent, but I was never really able to check the details until I returned to my hotel room and backed up all my footage and images. And that’s when I started to notice the interesting quirk about Portrait Mode on the iPhone X. It tends to over-choke the mask on the foreground object and sometimes confuses foreground for background data (and vice versa). Let me say first, that I love, love, love shallow depth of field. Soft backgrounds and crisp subjects are magical. That’s the thing I’ve disliked about most phone photography in the past is that images tend to be flat with relatively no separation between foreground and background. As a matter of fact, for nearly 30 years of shooting video I have always preferred under-lighting a scene to force my iris wide open to capture that shallow depth of field. With the iPhone, Portrait Mode has become my “go to” setting for stills. That said, it doesn’t work the way a traditional DSLR camera and lens works. I don’t know how the magic is made in Portrait Mode on the iPhone, but somehow the geniuses at Apple have pulled it off. The two lens camera is able to distinguish subject from background and somehow it softens the background while keeping the subject crisp. Now “Portrait” Mode implies capturing the image of a person, but since I’m the guy who loves a shallow depth of field I use it to shoot anything and everything, from Israeli plant life, to beer bottles, to Corinthian column capitals and what I noticed is that sometimes Portrait Mode has a hard time distinguishing the subject from the background and on occasion parts of the image get blurred that should be sharp. This can be very aggravating and can ruin a great image. Olives in the Jerusalem Market — This animated GIF image clearly shows the problem. Notice the blurred green olives in the foreground at the bottom of the pile. Those should be crisp like the rest of green olives. This would only require a simple Photoshop fix, but an extra step none-the-less. The good news I learned is that when you shoot in Portrait Mode the iPhone actually saves two images; one soft-focus and one entirely crisp, and this may just be Apple’s safety net for us pros. For most shots, someone with a few Photoshop skills should be able to quickly fix an image by replacing or rebuilding some of the foreground. An extra step indeed, but definitely worth it to save that important shot. A few years ago I stopped carrying my DSLR in favor of the iPhone’s camera in my pocket. The lens on my iPhone 6 was extremely limiting, the flat images were disappointing, but the convenience of a camera with me at all times was fantastic. I tell people continually,“the absolute best camera in the world is the one in your pocket when you need it.” It’s always better to capture the moment with an old grainy flip phone, than to miss the moment altogether. Now with the iPhone X and Portrait Mode’s shallow depth of field, my pocket just got a lot happier and my photos just got a lot better! Notice the top of the beer bottle gets blurred with the background and the sides of the bottle get choked in too far. Notice the yarmulke on the shopkeepers head gets blurred into the background. The trees in the far distance between me and my wife are seen as foreground data and are kept crisp. Most examples are of foreground info being seen as background, but this is one where background info was seen as foreground. Granted this is a hard shot to distinguish foreground from background, but it’s the worst case I experienced on my trip to Israel. I added the wide shot to this sequnce for perspective, but notice the brim of the artists hat above his nose on the close-ups. When we arrived in Jerusalem we took communion at an overlook above the city. Notice how the top of the cup at the bottom of the frame registers as background data. In this one, notice how the coke logo on the can in the foreground is blurred. Please share this with anyone who needs it and comment below about your experiences with Portrait Mode.